Got questions regarding Landbot billing and payments? Check the most common here! 1️⃣ How do subscriptions work? We offer yearly and monthly Starter, Professional and Business plans, which you can read more about on the Subscription section of the app (Dashboard - Avatar - Subscription). All our plans are recurring, and if you want to unsubscribe you must to cancel your plan before your prepaid period ends (term end). You may process a cancellation under the Subscription section. Learn more. We don't offer trials for our premium plans, but a 7-day money-back guarantee.​ So you can upgrade, test the app for 7 days with all its features and then decide if it's worth it according to your needs! If Landbot is not what you are looking for, write at help@landbot.io and we will refund the 100% of your fee. The 7-day money-back is calculated from the moment of your first upgrade and can be required only once. 2️⃣ How do I cancel my premium subscription? When upgrading to a premium plan, you can pay on a yearly or monthly basis. You can unsubscribe at any time, which is pretty much a plan downgrade from the subscription section to our free Sandbox plan. Your cancellation will be effective at the end of the prepaid period (when the year or month expires), as Landbot does not issue refunds for contracts cancelled before the contracted period ends. Please take into consideration that both plans (yearly and monthly) are recurring, therefore, if you wish to unsubscribe you must cancel your plan before your prepaid period ends (term end). Also, note that if you forget to downgrade, you have 3 days to ask for a refund of your last charge. In no case, it will be refunded more than 1 month fee. There's a 7 days money back period to test all the incredible features of Landbot. You can upgrade, test the app for 7 days with all its features and then decide if it's worth it according to your needs! In case the app is not what you are looking for, contact our Support Team and ask for a Refund. You will receive it in 5-10 working days. 3️⃣ How is my subscription charged? Your credit card will be charged automatically at the end of each billing period. So, if you opt for a monthly plan your card will be charged on the first day of the new monthly billing cycle. If you are on a yearly plan, your card will be charged on the first day of the new yearly cycle. 4️⃣ Why is my card being declined? If your credit card was declined, it’s normally to do with your bank’s automated fraud systems, and not with Landbot or Stripe (our payment processor). If this happens to you, please make sure your credit card information is correct and try to submit it at least three times. If the transaction still doesn’t go through, you will need to call your bank to clear the transaction. Every time Stripe submits a charge request to your bank, its automated systems determine whether or not to accept the charge. In order to determine this, Stripe takes several things into consideration, including account balance and card expiration date. 5️⃣ What forms of payment are acceptable? Landbot is a prepaid online service, so all services are paid for upfront and before use by credit or debit card. We can’t support purchase orders, payments by PayPal, or send you an invoice that requests payment. However, manual invoices are available for users on the Business plan. 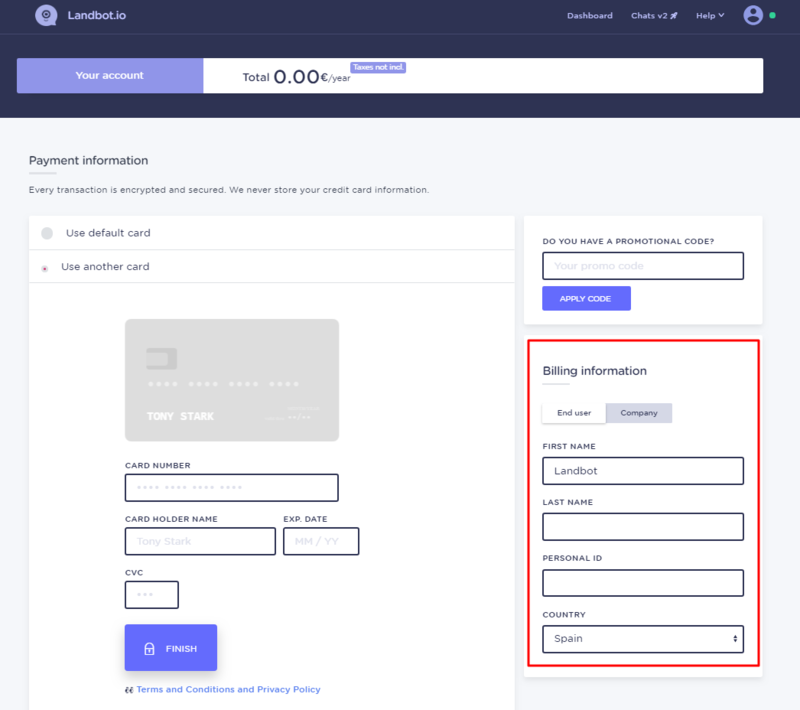 After any order or payment, an invoice/receipt detailing the transaction, and showing it’s been paid, is sent to the billing email address for your account. 6️⃣ Which credit/debit cards do you accept? 7️⃣ What payment gateway do you use? 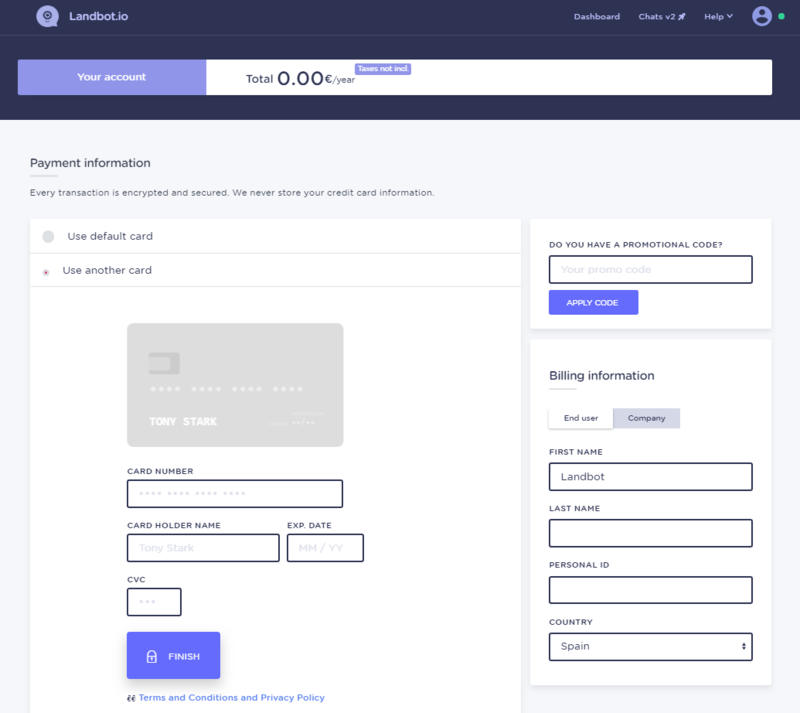 Landbot uses Stripe, a well-established, secure, credit card payment gateway service to process your credit card payment. 8️⃣ What payment methods are not accepted? 9️⃣ How do I change my billing information? While logged in, click on the top-right corner to expand your user menu, and select Subscription. 1️⃣0️⃣ How can I delete my credit card information? You cannot delete your credit card information from the user menu if you no longer want to use a card. For this, you will need to contact support, so feel free to drop us a line at legal@landbot.io! 1️⃣1️⃣ How do I view or download my invoices? If you need a copy of your receipts/invoices to present to your accounting department, or for year-end tax calculations, you can view, print, and email receipts from your account. At the bottom you'll find all your past invoices. Click on them to download each in PDF format! 1️⃣2️⃣ Can I edit my invoice details? We are not able to amend an invoice which has already been issued. 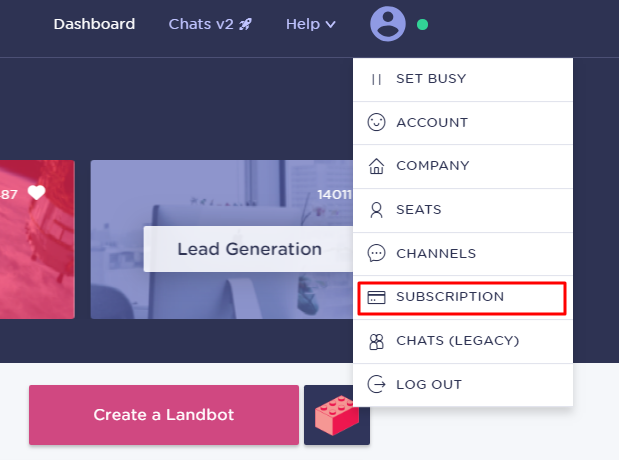 You can edit your invoice details by logging into your Landbot account under the Subscription menu. Once you have updated your information, all future invoices will be issued as per your last amendments. 1️⃣3️⃣ Can I add VAT to my invoice? 1️⃣4️⃣ What happens if I miss a payment? We have an automated process in place which attempts to bill your card several times over a period of various days before we downgrade an account for non-payment. If this happens, our team will contact you to make sure everything's OK with the payment information, and you'll have the chance to update it. 1️⃣5️⃣ What currency will I be billed in? All subscriptions are billed in Euro (€). If you have a billing or payment question that hasn’t been answered here you can send us an email to help@landbot.io and we'll help you out!.